Spain coach Luis Enrique picked his first squad last week, but there was no place for Barcelona’s Jordi Alba nor Chelsea star Pedro. Given the quality available in the talent pool to select from, it’s always going to be a difficult process for any Spain coach as world-class individuals are going to be left out. As noted by BBC Sport though, Alba’s snub was a major talking point in particular as following on from falling out of favour at the Nou Camp while Enrique was still in charge of Barcelona, it was suggested that perhaps the pair weren’t seeing eye to eye. Particularly given that he has been a fundamental part of Ernesto Valverde’s plans since Enrique left, it certainly seemed like a strange call. As for Pedro, he’s bagged two goals in three Premier League games so far this season, but still, it wasn’t enough to impress Enrique. As noted in some of the tweets below, Alba has since explained that his celebration was for his son, but for both Spaniards to do the same celebration on the weekend after the squad announcement, coupled with the fact that they appear to be shielding their eyes to perhaps suggest they can’t be seen by Enrique, it seems like a major coincidence. 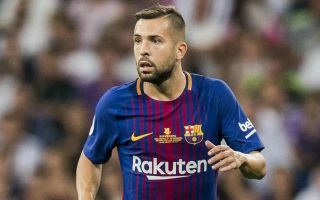 Nevertheless, fans can only accept Alba’s explanation on the face of it while Pedro hasn’t offered his own for now, and so it appears as though neither are willing to suggest it was a direct message to their national coach after failing to feature in his early plans.